It was about a decade in the making: without much fanfare the World Bank has released a report stating that the Dead Sea – Red Sea Canal project (also called the Red Dead Conduit) will work. The basic idea is to take salty water from the Red Sea, pump it up to a channel, desalinate it and then run the excess saline water to the Dead Sea via the channel where it can replenish the super-salty water at the lowest place on earth. Fresh drinking water will go to Jordanians as well as energy created by hydro-electric processes. The Dead Sea is shrinking due to human overuse of water that should normally run to the Dead Sea, as well as mineral cultivation in the South end of the sea by the Dead Sea Works owned by Israel Corp (ILCO:Tel Aviv). While the World Bank report (which can be downloaded here in English, Hebrew and Arabic) says that the canal is feasible and contingent on about $10 billion in investments, it does point out some environmental considerations. It is these very considerations, green organizations like Friends of the Earth Middle East state, which should stop the Red-Dead plan from ever materializing. In a statement issued after the publishing of the report, Friends of the Middle East write that the World Bank study is “irresponsible” and that their conclusions do not match the findings in the report. 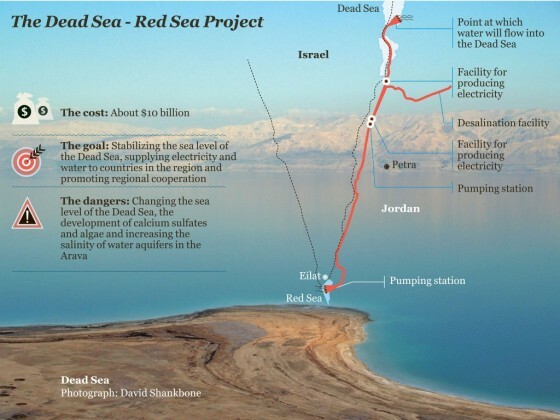 In short: The ‘Red Dead Canal’ project idea has wasted a decade for the Dead Sea, says the NGO which is based in Israel, Jordan and the Palestinian Authority. “If this project were to go forward, the real beneficiaries would be Israeli business tycoons associated with the building of the largest desalination plant in the world, and foreign pipeline construction companies. The public would be the ones to foot the bill, twice over – once, in unaffordable water prices, and again, in the further demise of the environment, said Gidon Bromberg, Israeli Director of Friends of the Earth Middle East (FoEME). What could go wrong? The final draft of the World Bank feasibility report confirms that the Red Dead project’s dangers include turning the Dead Sea into a sea of red algae blooms and milky white gypsum formations, polluting with sea water the ground water in the Araba / Arava Valley, as well as negative impacts on the coral reefs in Eilat and Aqaba, according to Friends of the Earth. The project study also established that the project suffers from a severe negative energy balance requiring up to two new power stations to be built in Jordan, to both pump marine water towards the Dead Sea, and the desalinated water over a 1000 meters up to Jordan’s capital Amman. Economic viability of the project is dependent on international grants of $5 billion USD, in addition to Jordan raising $2.5 billion dollars in loans for associated water infrastructure delivery costs to Amman. Only if these 2 conditions are met, will the private sector then invest the remaining $2.6 billion dollars needed for the construction of desalination plants. “The study seems to forget that there is a global economic crisis, that Jordan is on the verge of bankruptcy, and that Israel is heavily in the red. The study also ignores the fact that a cubic meter of water from this project would cost up to $2.7 in Jordan; an impossible expense for Jordanians to pay, that will lead to riots in the streets. Similarly, for Israelis and Palestinians, the water from this project will cost $1.8 per cubic meter, more than triple the cost of desalination at the Mediterranean,” said Munqeth Mehyar, the Jordanian Director of FoEME. The regional water NGO says there are alternatives: the partial rehabilitation of the River Jordan and have the Israeli Dead Sea Works and the Jordanian Arab Potash company pay for the water they extract from the Dead Sea – which would give them an incentive to reduce their harmful impacts on the Dead Sea. On its Facebook page the World Bank says public consultations on the draft reports of the World Bank managed Red Sea-Dead Sea Study Program will begin next month in cities in Israel, Jordan and the Palestinian Territories. Exact times and locations for all the public meetings will be posted as they are confirmed. Time to get involved, if you have a say. I disagree with your alarmist presentation as the Dead Sea , DS,will vanish unless Israel reinstate the 1.2 mcm taken to water the Neqev and Jordan stop utilizing the water . Historically 1.5 mcm year poured into the DS kept a healthy balance with the 1.2 MQM evaporation . The surface area was in 1956 over 1000 SKM , now it is half of that area. The idea of algae and whitening of the surface of the Dead Sea is not true. Please refer to the findings of the Israeli Dept of Geology Professor Oz in Jerusalem who has been moneteringthe DS since 1930 and they will confirm that your Friends of the Earth alarmist are not based on scientific findings. The other group that is fighting this project are the two companies that are extracting the rish mineralized waters of the DS. They do not wish to loose a good business. Though Jordan might not afford the totality of the project, yet it has always been undestood that countries responsible to transfer one million Palestinians to Jordan should foot the bill for building the pipeline that will carryt the waters from the Red Sea to the DS. The Desalination plant is a pure commercial undertaking. It can be undertaken on a take or pay bases for taking the purified water. The transfer of water to Amman, Jerusalem or Hebron is the sole responsibility of the Municiplities . They should provide the guarantee that they will pay for the potable water desalinated. So many years have been wasted studying this project . Unless this project is undertaken, a massive salt lake will creat worst environmental calamity by changing the climate in Jordan due to the reflection of the salt bed of the ex DS water. Wel,maybe a solar powered(CPS) desalination plant can be put up on the red sea and the brine pumped(again by solar energy)using a pipeline to the dead sea ….whats so ‘irresponsible’ about that? Not to worry. This plan has been talked about before, and shelved due to environmental and financial costs.